thanksgiving is over (and I’m still stuffed), which means…the holiday season is here! queue mariah carey, geroge winston’s december, and all the good things seasonal. for a lot of people, the holidays mean a lot of company, which is a big stresser. getting your home ready to host is stressful enough with decor, recipe planning, present buying, etc., and you may find yourself running around trying to find a plumber who can fix that leaky faucet, or update your years old shower head before your guests arrive. however, with a few of unimaginably simple and cost efficient updates, you can completely transform a bathroom, or even update your kitchen - get this - all on your own: no professionals required. check out some of our favorite ways to elevate our home decor without elevating our heart rates (or breaking the bank!). 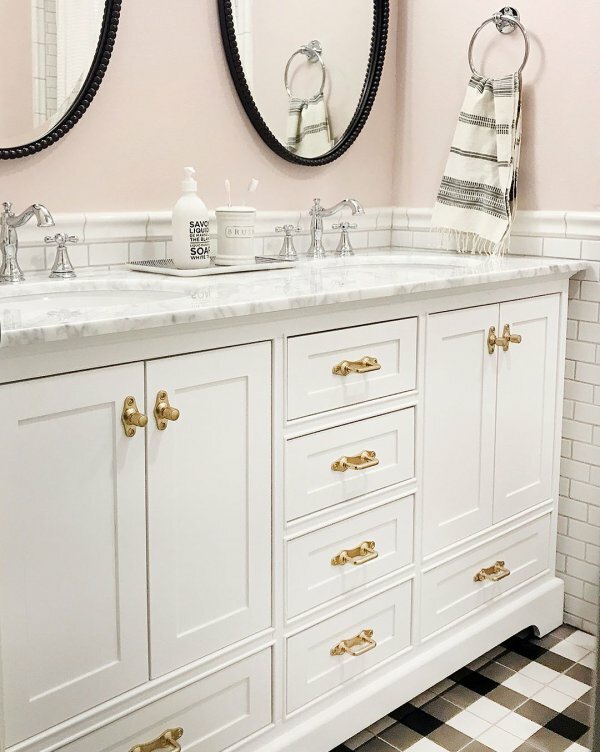 one of the easiest things you can do to instantly give any room in your home a fresh feel is to swap out the hardware on your vanities and cabinets. finger pulls are extremely popular right now, and make away with having to decide whether you want pulls here or knobs there; they can go everywhere and be twice as functional. we love these understated pulls in particular because of their sleek design that adds a subtle but impactful touch. 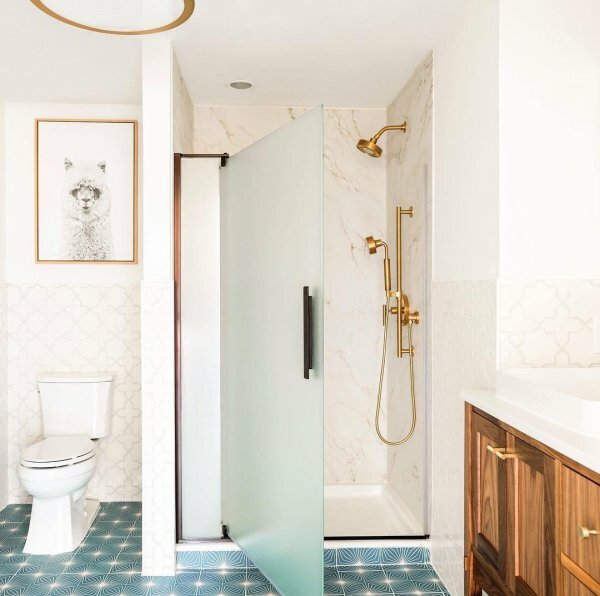 before you scramble to find a plumber right before the holidays (with a less than likely chance of success) to update your shower trim, take a deep breath and revel in the fact that you’re more than capable of giving your shower a simple refresh without the assistance of a professional. make sure that your current brand of trim matches your new trim, and you’ll be good to go. as a guest, nothing is worse than showering in a gross shower (asides from nasty grout), so give your guests the gift of an amazing, spa-like shower experience with the incredible kohler purist shower head. we’ve tried it, we love it. delight of design stamp of approval! to make huge impact in any space or liven up any wall, think: wallpaper. no, not that yellow stuff you had as a baby or made the woman go insane, but wall coverings, like this luxe veneer covering by maya romanoff. it’s super easy to apply and is the statement of all statements. we love all of maya’s offerings, but there’s something about a wooden wall veneer that is just exceptionally exceptional. if you’re looking for a way to “wow” your guests, look no further. wooden walls are back, to some extent. again, before you go running to your plumber in fear of installing a faucet, try it yourself! despite what many think, it really is as easy as twisting a few knobs. replace the cheap leaky thing you’ve had forever with something like the brizo rook with an open water channel in luxe gold. believe us, it’s super easy, it’s super stunning, and your guests will be super impressed. we wrote a post a while ago about ledged mirrors which you can read here, but are still in love with deep-frame mirrors. literally as simple as hanging a picture frame, you can update an entire room and make it feel nearly twice as large with a new mirror. your guests will be left in awe of how on-trend you are. nothing says “ahhhh” like a fresh coat of paint. 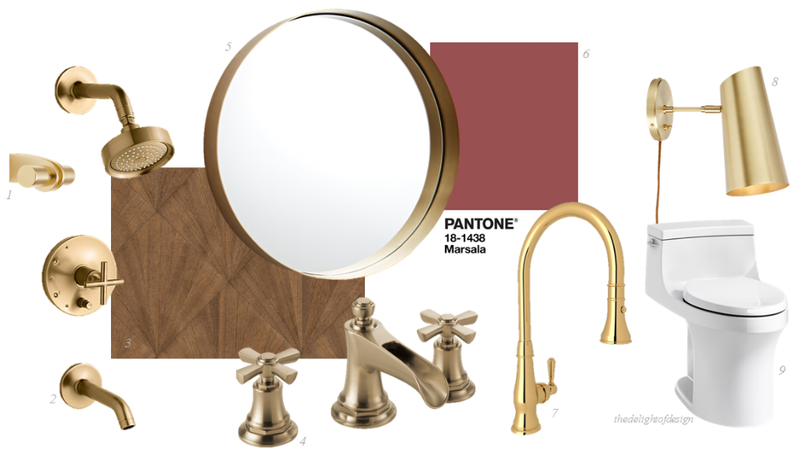 marsala is one of pantone’s colors of the year (2015), and it fits perfectly with the rich brushed gold tones that are perfect for the season. add a fresh coat of paint to any room and you’ll go from ~drab to fab~ in an instant. mix in a coat of bright white paint on your trim & baseboards and you’ll have a dashingly refreshed space to hibernate in during the winter. baby it’s cold outside, after all. a kitchen faucet is one of the most critical, if not the most critical, fixture or appliance in a kitchen, the heart of the home. 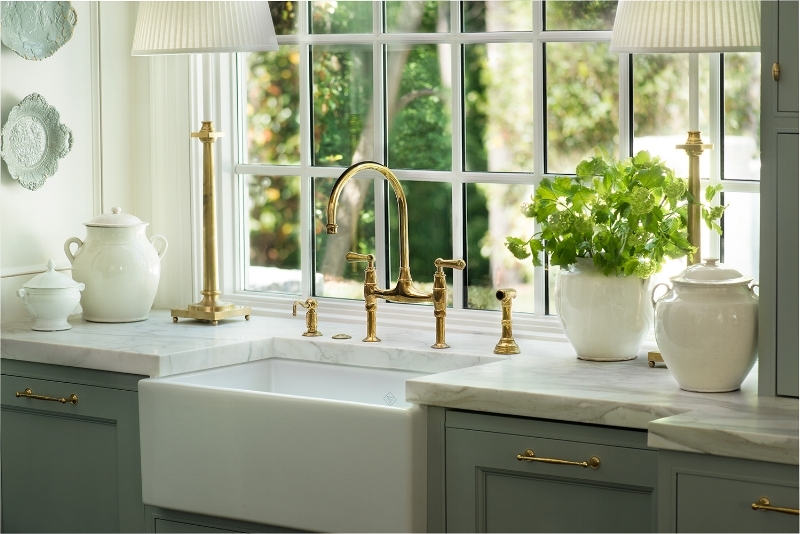 with a simple faucet upgrade, you can make your entire kitchen gleam. the rohl italian grass is SO stunning, it’ll leave all your guests speechless. if you’re swapping out the same configuration of faucet, this is absolutely something you can do yourself. don’t waste time trying to nail down an expert - I promise you won’t break anything! we love sconces, and plug-in sconces are as easy to install as a picture is to hang. install one to brighten up any space or to add some ambient/task lighting to set the mood. all you need is an outlet available to literally plug and go. we love the vast offering that rejuvenation has for plug-ins in regards to finishes and style. the best part: no electrician required, or even recommended. okay, so replacing a toilet is a little more involved than the aforementioned updates, and might not be a project for the novice (though it is absolutely doable, and I recommend trying if you’re okay with gettin a little gritty), but a brand new toilet makes a world of difference in a bathroom. if you have any cracks or chips in your current toilet, you could be growing mold or hiding lord knows what. the san souci is a compact-elongated one-piece toilet, and is just about as welcoming as a toilet gets. if a total toilet replacement is too much of an ordeal or too costly, something as minute as replacing the toilet seat can make a huge difference, too. it is the most (second-most?) interacted-with component of your toilet, so a new seat is almost as impactful as ditching the entire toilet for a new. any one of these updates can make a tremendous update to your home, but altogether, you’ll feel like you’re in a new space and your guests will be living their best (holiday) life. be sure not to make them too comfy, because nothing is worse than that guest that overstays their holiday welcome. do you think you’ll try any of these out? let us know in the comments! cheers!